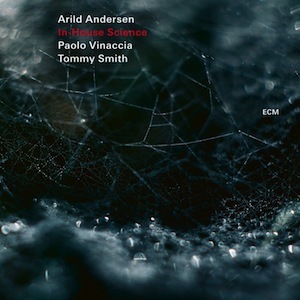 Personnel – Arild Andersen: acoustic bass; Tommy Smith: tenor saxophonist; Paolo Vinaccia: drums. A new trio album by the Norwegian bass virtuoso Arild Andersen is out on the ECM label, promising to stun whoever takes a mindful listen to the marvelous music that inhabits here. The bassist played in amazing trios in the past, teaming up with Sam Rivers and Barry Altschul (albums) as well as with Jan Garbarek and Edward Vesala (albums), but the musical quality was not taken down when he was joined by Scottish tenorist Tommy Smith and Italian-born, Norway-based drummer Paolo Vinaccia on In-House Science. Recorded live in Austria, the album includes six original compositions by the bassist, whose durations are comprehended between 8 and 11 minutes, approximately. With a remarkable ability to play several idioms, the sharp-witted trio creates music that is honest, vast in dimension, and raw in tone. One has immediate access to Andersen’s colossal gutsiness and technique on the opening tune, “Mira”. The bassist starts alone, guaranteeing harmonic definition and rhythmic heft from below. The soothing triple-meter cadence is intensified when the saxophonist comes to the forefront, taking folk and jazz trajectories, or when the drummer adapts his whispering cymbal strokes to the mood. On “Science”, the rhythm section explores with vision, pointing the direction with a push-forward attitude while having extended saxophone runs molded by a variety of timbres. At some point, the piece shifts to a rhythm where hi-hat and walking bass command, anticipating swinging epiphanies occasionally interrupted by bass pedals, puffed up funky blazes, and visceral free jazz blowouts. It’s great to hear Smith releasing fiery multiphonics and dazzling chromatisms that ring in the air. This fiery posture, which leans on free jazz to a degree, is also what makes “In-House” burn and gaining ground with a nervy spin and full-steamed propulsion. If the rhythm section does the heavy lifting here, they considerably low the tone for “North of the Northwind”, a reflective if resolute adventure where bowed bass, samplers, and prolonged saxophone notes are layered to produce a static effect. If one can sense a folk tactility coming out of the saxophone on “Venice”, an empathetically groovy piece in six, it’s pretty clear that “Blussy” is a blues-based post-bop incursion saturated in jubilation and gracious manners. Andersen is a fabulous and inveterate soloist whose terrific language, full of groove and rhythmic contortions, will blow your mind. Both the musical resources and imagination of his simmering trio are limitless and can easily assault your senses. With no time for ironies or playful games, they work brilliantly together, coloring their captivating soundscapes with a cutting-edge vibrancy.